The Marple Website is Main Sponsor of the 2012 Christmas Cracker! The Marple Website was proud to be the main sponsor for the Marple Christmas Cracker in 2012 with a donation of £1,000 from the income of the banner adverts displayed on the main site, the forum and the Virtual Tour. This follows on from the contribution of £1,000 to Friends of Marple Memorial Park last year towards their Diamond Jubilee Project in front of the library. These donations continue the contributions made each year by the web site to local causes that first began in 2006 with the Iron Bridge Project and now total £6,700. For the last two years this has been possible thanks to the support of the local businesses that have taken up the opportunities to advertise on the site, so a big thank you to them - check out the banners to see who they are. A banner advert is a great way to promote your business and support your local community web site at the same time. Banners are only available to local Stockport based businesses and there are discounts for Marple Business Forum members too. So if you are interested in promoting your business on the site have a look here, and get in touch. 1.6 Million image views on the Marple Website Virtual History Tour! With the landmark milestone of 1,000,000 images viewed on the Marple Website Virtual History Tour passed in May 2011 and with the counter now at 1,620,542, this has been another record year with 398,880 image views since Christmas 2011. This is 22% up on last year and is due to the ongoing support of Marple Local History Society, who continue to share their photographic archives with the community through the site, and Arthur Procter, who has continued his incredible efforts to record just about every local event for posterity on the Virtual Tour. With contributions from others too, these have included this year's Mellor Wheelpit Opening, Marple Carnival, Hawk Green Pass the Baton, Shaw Cain Open Day, Chadkirk Festival / Opening of Chadkirk Bridge, Romiley Young Farmers Show, Marple Food and Drink Festival, Handover of the Iron Age Ditch at Mellor, Pride in Marple Awards (courtesy of Mike Frisbee) and Marple Christmas Cracker! Arthur and others have also recorded the progress of construction projects at Marple Station, Otterspool Bridge and Chadkirk Bridge (in the Dan Bank / Dooley Album) and Macnair Court in a year that has seen many changes. Nearly 1,100 new images have been added to the Virtual Tour since last Christmas. As well as those from the History Society and Arthur, a good number have been provided by other individuals too. Special mention is due to Ray Noble, Bill Beard and David Burridge for their efforts and my thanks go to everyone who has made a contribution to the growing collection. Please do keep sending your local photos in, old and new, throughout 2013. If visits continue at a similar rate we could reach 2 million views by next Christmas! I wonder how close we'll get? In 2011 the first videos from Marple Local History Society's archives of people talking about their memories of Marple and the surrounding areas were put on-line in the Virtual Tour. These were recorded by the late Gordon Mills between 1996 and 2004. This year I was particularly pleased to be able to add Gordon's historical classic "Marple's Changing Face" video to the collection. This is a very special work from a man who was hugely supportive of this web site when it first started in 1998. Talking of people who've supported the site, Arthur Procter's photographic contributions in the last few years have been immense. 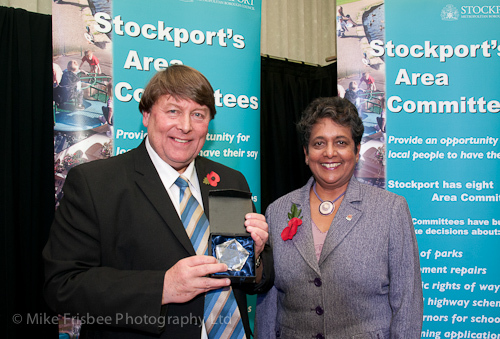 I was pleased when my nomination for him to receive a Pride in Marple Award was supported by a number of other local groups too and delighted when he received an award in the "Volunteer of the Year" category. A much deserved recognition of a fantastic effort. Web site at the Heart of the Community! The Internet has grown immensely since the site began in 1998 and many local organisations now have their own web sites. I was happy to help a number of them set up their own sites this year, including Marple Carnival, which was sponsored by The Marple Website in celebration of 50 years of Carnivals in Marple. Long may they continue - and if you feel the same way, why not get in touch with Chairman John Wright about getting involved, as they are once again struggling for enough volunteers. 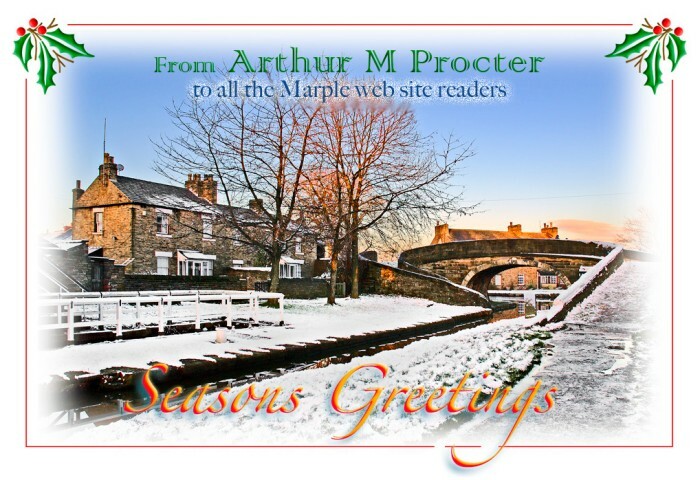 I was very pleased to help Marple Local History Society set up their own web site this year too. It was developed with a small team over a period of several months and launched in September 2012, at the same time as they launched their excellent new local history publications - visit their new site to see them. The society kindly made a very generous donation of £500 toward the Friends of the Park Diamond Jubilee Project too. I was also delighted to work with the Mellor Archaeological Trust to set up a second-generation web site for them to be able to expand and grow for themselves in the future. This is now home to the fascinating "Bob's Diary" of the goings on at Mellor Mill as the group expose more and more of the foundations of Samuel Oldknow's historical legacy. I'm also pleased to have played a part in helping the Trust to bring an historic painting of Mellor Mill home to Marple, hopefully to be displayed in Marple library. More about this in the New Year! Despite many organisations now having their own web sites the Community Pages remain important as a central hub that enables local groups, with or without their own web sites, to promote themselves to a larger audience. This year new members to "sign up" are Hawk Green Folk Dance Club, Marple Christian Care, St Martin's Church, Low Marple and Friends of Cromwell Avenue Park. New groups are always welcome to join the Community Pages. All you have to do is provide some words and pictures to get started - it couldn't be easier, so do make the effort now. If your group wants to set up its own site then I can also provide low cost hosting and support to help you to do this if you need it. Friends of Marple Memorial Park keeping busy! I've already mentioned Friends of Marple Memorial Park a couple of times and, as regular visitors will know, my wife Gill and I are actively involved with the friends group and have been since it was formed in 2003. 2012 has been a very successful year for the Friends of the Park, particularly with our programme to replace or refurbish the park's benches and our Diamond Jubilee Project to refurbish the dilapidated flowerbed in front of the library. Both of these projects have had fantastic community support too, with benches sponsored by local families, Marple Senior Citizens, Marple Business Forum, Costa Coffee and, most recently, All Things Nice Coffee House and Deli (to be installed very soon). The Diamond Jubilee Project received generous contributions from The Macnair Trust (£600), The Marple Website (£1,000), Friends of Memorial Park (£1,000), Marple Bridge and Mellor U3A Gardening Group (£25), Marple Local History Society (£500), Marple Civic Society (£500), Cheadle & Marple College (£300), Marple Business Forum (£100), Marple Area Committee (£1,000) and Stockport Homes (£1,000). Although the project took far longer to complete than we expected because the council decided we needed full planning permission, it has been very well received and everyone seems to like it, especially Wayne Chaisty's sculpture. In 2012 we also continued working with Marple Vision Partnership, local skaters and SMBC on the project to refurbish and extend the skate park. We now have preliminary designs and have consulted with users but funding it is going to be a huge challenge as the total cost is likely to be between £75,000 and £100,000. Sources of funding are pretty sparse and the moment and we need to have 20% of the money in place before we can make a landfill grant application. We've set an ambitious target to try raise £15,000 to £20,000 in the next 12 months, so if you support this and you can help in any way please do let us know. Last year I was relieved to start sharing the load of looking after the busy forum with new Moderators Lisa Oldham and Howard Roberts. I'm very grateful to Lisa and Howard for continuing to help out and I'd like to extent my thanks to them both and to everyone else who supports the web site and keeps on coming back - that's what it's all about after all.